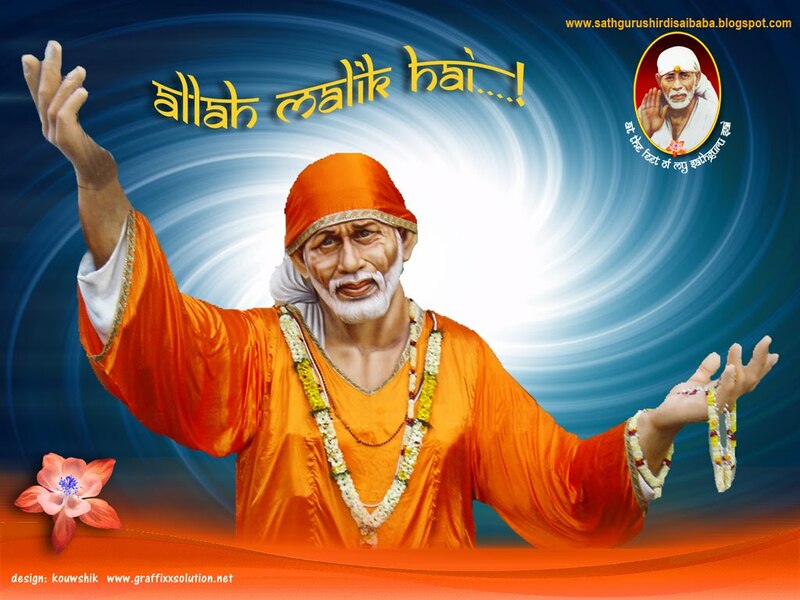 Journey of life with Sai: a summit stop at parenthood-Experience of a Sai devotee. "If you cast your burden on me, I will bear it!If you seek my help and guidance I will immediately give it to you.There shall be no want in the house of my devotee"-Sai Satcharitra. 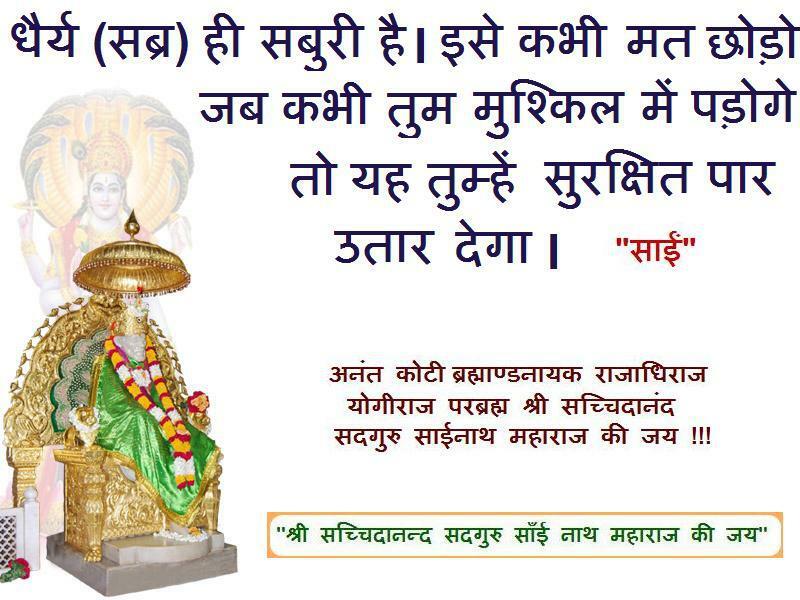 Anyone who has put complete faith and trust on Sai will experience how true these words of Baba are .Here is another experience of baba's devotee shared below. Jai Sai Ram . I feel extremely blessed that Baba has made me write and share the magic that happened in my life with my fellow Sai devotees. As everybody would know that having Baba in our hearts will keep us from all bad vibrations and miracles are like day to day events. By Baba’s grace, I’m sharing mine and I feel really honored. I was born and brought-up in Tamil Nadu, India by loving parents. While I was growing up, ours was a very compact family (my father and mother, myself). Although we were a middle-class family, we always cared about the society and helped the poor. My parents (especially, my father) taught me all the morals and home science and I wont be who I am now without them. Again, I thank Baba for giving me such wonderful parents. To be honest – Sai Baba has been with us throughout my life, often in the most unexpected ways. 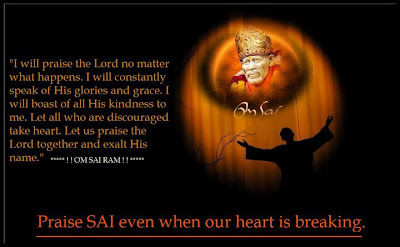 Sai Baba first came into our lives through Vijay TV’s “Sai Baba” serial on Wednesday evenings. We didn’t watch that as a serial but believed that Baba is coming to our home on Wednesdays. We have always thought that whoever have played Sai Baba’s role is the real Baba and we took all the advice given by Baba and tried to follow that in our lives. That’s how Baba entered our home and started to rule our hearts . Since then I became a devotee of Baba. 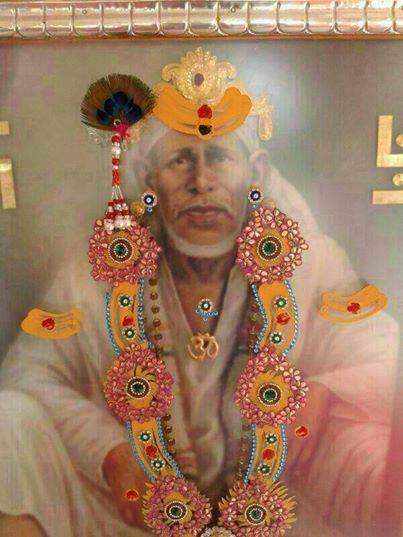 Up until my marriage I was only a normal devotee of Baba but I believed him with all my hearts. I never thought that Sai Baba would make his presence so obvious in my marriage. I got married in December 2008 to Vijay at “Kapaleeswarar Karpagambal Thirumana Mandapam” Mylapore, Chennai. SAI's divine guidance to 'Autobiography of a Yogi'-Experience by Ashalatha. With Baba's grace and blessings I am resuming to share wonderful and blissful experiences of our Sai Ma with you all again. Though Sai Baba is our ULTIMATE GURU/FATHER he blesses and guides his children from time to time to experience and feel the divineness of other great saints and gurus as Baba believes that all divine souls act in unison and are part of the single supreme divinity. Asha sister is a blessed daughter of Sai who has shared many divine experiences of Baba with all of us previously. Our all compassionate Paramapita Sri Satchidananda Sadguru Sainath Maharaj have been guiding me to other Saints and Mahans. In this post I am sharing how I was directed to Sri Paramahansa Yoganandaji. I submit my humble prostrations at the divine lotus feet of our Sadguru Sai for shaping me through divine experiences, and heartily thank Manisha sister for being an instrument in giving all of us an opportunity to share thy’s divine play to the spiritually associated ankitas. For years, I have been reading glimpses about Sri Paramahansa Yoganandaji but have never been blessed to read the divine literature the “Autobiography of a Yogi”. My soul sister Hariniji gifted Autobiography of a Yogi to my son on his birthday 24th September 2016. I was so grateful for this divine gift and desired to start the parayanam. But again, I was engrossed in other activities and didn’t get a chance to read it. On a Thursday morning me and my husband went for Sri Sai darshan, rejoiced in Kakad arati and were involved in few sevas in the mandir. While doing so, I found an A4 size laminated photo of Geethacharam (the photo of Lord Krishna giving Geetha upadesh to Arjuna), I was so fascinated by the sight of Lord Krishna, and coveted to take the picture. I was intending to seek uncle’s (manages the temple activities) permission, but then I changed my mind and desired Sri Sai to indicate me in his mystical way to take it. I reserved my thoughts. 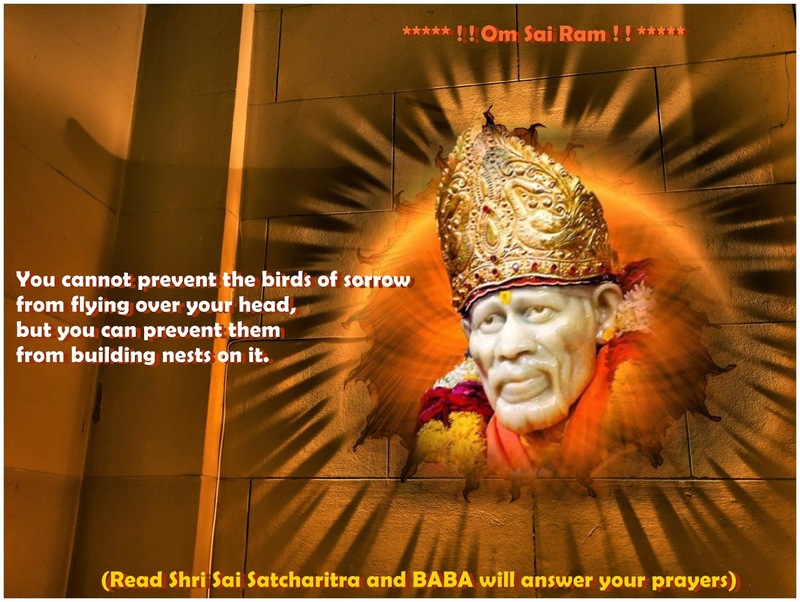 Here is an experience shared by a Sai devotee how Baba helped and blessed her . 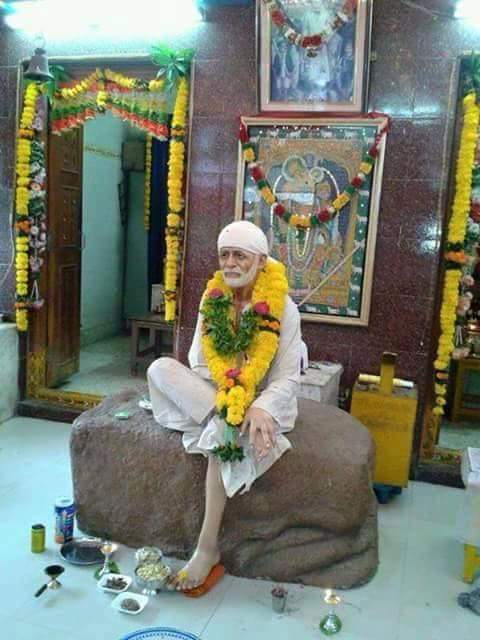 Jai Sai Ram . You must be doing great with Sai’s grace. I would like to thank you for providing great platform for devotees. As before, I would like to be anonymous devotee. 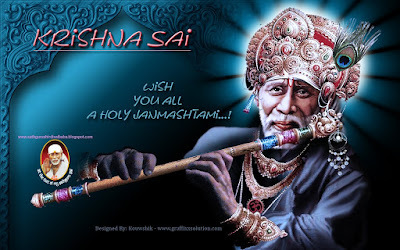 I have already posted two experiences back in 04-10-2012 (Believe In Sai -Experience By Anonymous Sai Devotee.) and 2014 with Sai’s grace. I would like to share with devotees about his recent grace on me. Academically I am graduate computer engineer (2003). In 2005 I worked as quality control engineer with CD-R manufacturing co. and then with other company for some time, but not as s/w Engr. I couldn’t work with software company as it was not easy to make entry in IT sector. Reason being gap in degree and 2nd class in engineering degree. So, I had given up the idea of working as a software professional. 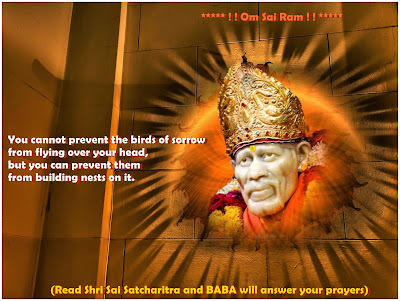 Shirdi Sai Baba's Grace-Experience Of Sai Devotees-Part 68. 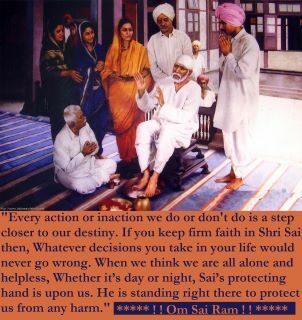 Shared below are couple of experiences by Sai devotees .Jai Sai Ram . I would like to post this experience as an anonymous devotee. I have written few experiences in the past and would like to add some more. Last week we were planning to go to Tirupathi all of a sudden. It was a plan that was unexpected. All of a sudden my whole family joined me and my husband in the trip. I was thanking my guru Sai Baba for making this trip beautiful. When I was standing in the long queue I started reciting Sai Baba's name. I was not very regular in chanting and started talking with everyone. But whenever I remembered I was doing namsmaran. A Life Given By Sai -Sai Devotee. The one who has put his faith and trust into the hands of this great and divine Shirdi Sai, who asked nothing of his devotees but patience, faith and love, will know just how true these words are. 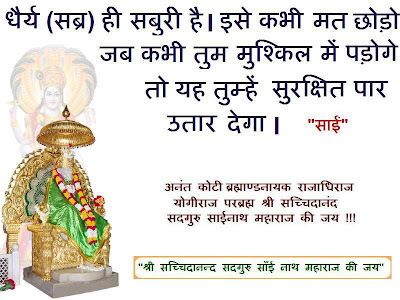 Below is the experience shared by Sai devotee who wishes to remain annonymous. I have accumulated so many incidents before writing this article. 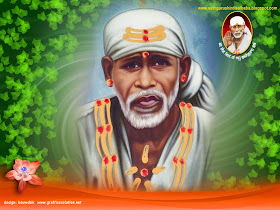 Earlier I have posted few miracles done by my Sai. But so many days passed and my important prayers are answered in these 3 years and Sai gave me a life which I am living. I was in love for more than 7 years and faced all sorts of problems with marriage. I stayed unmarried till I am 32 years. I was not working, but a doctor sitting in home with no hopes. Just to look at Sai was the full day's work for me waiting for some good to happen. I waited for 3 years in native, not meeting with my man. I fell like everything is falling apart. I was not allowed to go to a job. I had only one option, to study for my entrance exams to post graduation. Baba's Grace and Kindness-Experience By Suman. Happy Baba's day and a very Happy Raksha Bandhan to all.May the sacred thread of Rakhi bind us in Baba's love and liberates us from all the bondages of the body and the physical world, and fills us with feelings of safety and protection. Let our feelings be pure and elevated for every soul. Let there be forgiveness and good wishes.Let this Rakshabandhan be a proof of self-transformation and complete faith at the Holy feet of Baba. We have already read few experiences that were shared by Sai devotee Suman .Today we shall be reading more about Baba's love and His blessing in her life. 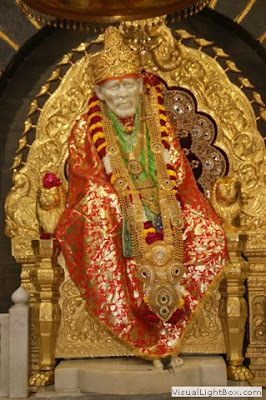 Jai Sai Ram . 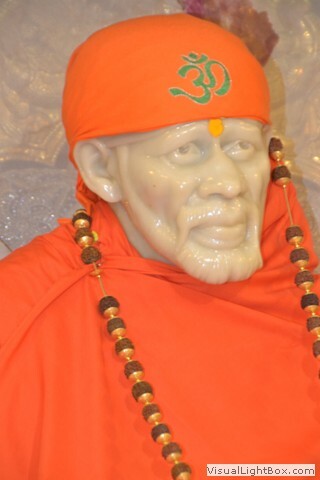 Hey sai baba I invoke your blessings and permission to write and share this beautiful, heart warming experience that I recently witnessed on my birthday this year on 15 august, all because of your grace and love on me. Baba communicated through your website. Sai Satcharitra Parayan in a metro and how Baba rescued me out of trouble. You can share my name on the site if you want. Baba please pardon me for any error done while sharing the post. It all started when I thought of celebrating Baba’s birthday(guru purnima) this year on 31st july 2015 by offering him a beautiful dress for that occasion just few weeks before Guru purnima, as I have never done anything special for him on this day even though I am his follower since last 10 years..sorry baba for my laziness. I thought it would be so good that baba wears new dress on his birthday. But our dear baba had other plan in his mind and this is how it materialized thereby. I went to the local sai mandir nearby and expressed my desire to pandit ji of offering vastra to baba on guru purnima. But pandit ji there refused my booking since they do not accept outside booking for that occasion. He also told me that baba’s dress for that day comes from mandir trust and therefore politely asked me to book for some other day. Sai Baba As A Bolster And Rescuer-Experience by Reena. With the grace of merciful Baba I have been blessed to resume His services at His Holy feet after a long gap . Blessed, Oh Sai, are Your Feet, blessed is Your remembrance and blessed is Your darshan which frees us from the bond of Karma. Though Your Form is invisible to us now, still if the devotees believe in You, they get living experiences from You. By an invisible and subtle thread You draw Your devotees from far and near to Your Feet and embrace them like a kind and loving mother. The devotees do not know where You are, but You so skillfully pull the wires that they ultimately realize that You are at their back to help and support them. The intelligent, wise and learned folk fall into the pit of the samsar on account of their egoism, but You save, by Your power, the poor, simple and devout persons. Inwardly and invisibly you play all the game, but show that you are not concerned with it. You do things and pose yourself as a non-doer. Nobody ever knows Your life. The best course therefore for us is to surrender our body, speech and mind to Your Feet and always chant Your name for destroying our sins. You fulfill the wishes of the devotees and to those who are without any desire You give bliss supreme. Chanting Your sweet name is the easiest sadhan for devotees. By this sadhan (means), our sins, Rajas and Tamas qualities will vanish, the Sattwa qualities and righteousness will gain predominance and along with this, discrimination, dispassion and knowledge will follow. Then we shall abide in our Self and our Guru (who are one and the same). This is what is called complete surrender to the Guru. Without further ado I would share Sai devotee Reena's experience today . Hope you are doing well. My name is Reena and I was a regular reader of Sri Shirdi Sai Baba articles on your site, Shirdi Sai Kripa. God bless or rather Baba bless this site and you and others associated with this site building and maintenance. It is such a great platform for sharing so many experiences of Sai Baba. I am writing one of my most recent Baba’s experience after 2012. 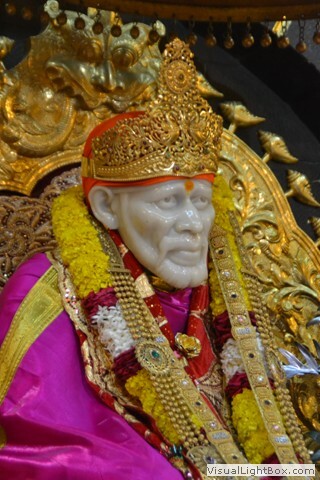 Other experiences which I had with Baba were posted on this website about 3 years ago.Below are the link to the experiences. Sai Baba Blessed Us With Child. Test and Symptoms Reveal Something But Baba's Grace Something Else. Baba is truly great. There are no words to describe His greatness, kindness, love, affection He has towards His devotees. Baba has said in Sri Sai Satcharita, that anyone who remembers Him, either with love or even without it, Baba will take care of Him. “Do not be sad that I am no more, my bones will move and speak to anyone who remembers me”. True to His word, any devotee who thinks of Him, meditates on His form, does Namasmaranam or recites His name with love and faith, Baba comes to their rescue. And yet after all this, Baba still does not expect anything from His devotees except for their love, devotion and remembrance. I was blessed with two beautiful children by Baba in 2009 and 2011 (experiences narrated above) and how things fell in place after that. My children are growing up and my work, kids and domestic chores take up most of my time; so much so that most of the times I could not even find time to concentrate or pray or remember Baba. All I used to tell myself was, “Baba, You know my situation, I hardly get time to sit back and relax. (Maybe, I was telling Him, even if I do not pray to You, please forgive me, since nothing is hidden from You”). But, dear readers, we tend to forget one thing. As much as breathing, eating are important for us to live, so also be remembering God or Baba.